OXFORD, Miss. 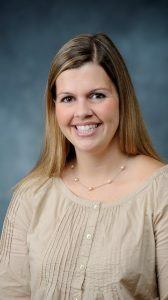 – Macey Edmondson, assistant dean for student affairs at the University of Mississippi School of Law, has been named president-elect of the National Association of Law Student Affairs Professionals. She will serve as president for the 2019-20 academic year. NALSAP is an organization for professionals who provide support to law students. The organization was founded in 2016 to serve as a “meeting place” for student affairs professionals to learn best practices, develop ideas, engage in professional growth and discuss issues affecting law students. Edmondson was a co-founder of the organization, along with Johnny Pryor, assistant dean for student affairs at Indiana University’s Robert H. McKinney School of Law; Rebekah Grodsky, director of academic and student affairs at University of the Pacific McGeorge School of Law; and Emily Scivoletto, associate dean for academic and student affairs at UCLA School of Law. The UM School of Law was instrumental in helping Edmondson and her student affairs colleagues found the organization. The school’s Transactional Law Clinic assisted the board of directors in obtaining the organization’s business league status as a 501(c)6 entity, allowing NALSAP to provide professional development opportunities. In just two years, the organization has grown, providing professional opportunities to more than 83 institutional members and 435 individual members representing 104 law schools across the country. Each year, NALSAP hosts a conference that includes informational sessions and presentations that focus on resources for law students. Edmondson served as program chair for the organization’s second conference. “I’m just so proud of NALSAP,” Edmondson said. “It’s amazing how fast our members have gravitated towards this organization. Edmondson’s goals as president includes developing online resources and programming, creating recurring communication updates among members and finding new ways for professionals to have their works published. “I want to make sure this organization is solidified and maintains good grounding to serve as a foundation for future student affairs professionals,” she said.